Billions of cells die each day in the human body in a process called “apoptosis” or “programmed cell death”. When cells encounter stress such as inflammation, toxins or pollutants, they initiate an internal repair program which gets rid of the damaged proteins and DNA molecules. But if the damage exceeds their capacity for repair then cells are forced to activate the apoptosis program. Apoptotic cells do not suddenly die and vanish, instead they execute a well-coordinated series of molecular and cellular signals which result in a gradual disintegration of the cell over a period of several hours. The remains of an apoptotic cell are being engulfed and ingested by a phagocytic white blood cell. Image via National Library of Medicine. 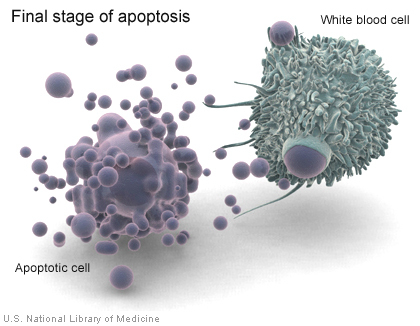 What happens to the cellular debris that is generated when a cell dies via apoptosis? It consists of fragmented cellular compartments, proteins, fat molecules that are released from the cellular corpse. This “trash” could cause even more damage to neighboring cells because it exposes them to molecules that normally reside inside a cell and could trigger harmful reactions on the outside. Other cells therefore have to clean up the mess as soon as possible. Macrophages are cells which act as professional garbage collectors and patrol our tissues, on the look-out for dead cells and cellular debris. The remains of the apoptotic cell act as an “Eat me!” signal to which macrophages respond by engulfing and gobbling up the debris (“phagocytosis“) before it can cause any further harm. Macrophages aren’t always around to clean up the debris which is why other cells such as fibroblasts or epithelial cells can act as non-professional phagocytes and also ingest the dead cell’s remains. Nobody likes to be surrounded by trash. Clearance of apoptotic cells and their remains is thus crucial to maintain the health and function of a tissue. Conversely, if phagocytosis is inhibited or prevented, then the lingering debris can activate inflammatory signals and cause disease. Multiple autoimmune diseases, lung diseases and even neurologic diseases such as Alzheimer’s disease are associated with reduced clearance. The cause and effect relationship is not always clear because these diseases can promote cell death. Are the diseases just killing so many cells that the phagocytosis capacity is overwhelmed, does the debris actually promote the diseased state, or is it a bit of both, resulting in a vicious cycle of apoptotic debris resulting in more cell death and more trash buildup? Researchers are currently investigating whether specifically tweaking phagocytosis could be used as a novel way to treat diseases with impaired clearance of debris. During the past decade, multiple groups of researchers have come across a fascinating phenomenon by which viruses hijack the phagocytosis process in order to thrive. One of the “Eat Me!” signals for phagocytes is that debris derived from an apoptotic cell is coated by a membrane enriched with phosphatidylserines which are negatively charged molecules. Phosphatidylserines are present in all cells but they are usually tucked away on the inside of cells and are not seen by other cells. When a cell undergoes apoptosis, phosphatidylserines are flipped inside out. When particles or cell fragments present high levels of phosphatidylserines on their outer membranes then a phagocyte knows that it is encountering the remains of a formerly functioning cell that needs to be cleared by phagocytosis. However, it turns out that not all membranes rich in phosphatidylserines are remains of apoptotic cells. Recent research studies suggest that certain viruses invade cells, replicate within the cell and when they exit their diseased host cell, they cloak themselves in membranes rich in phosphatidylserines. How the viruses precisely appropriate the phosphatidylserines of a cell that is not yet apoptotic and then adorn their viral membranes with the cell’s “Eat Me!” signal is not yet fully understood and a very exciting area of research at the interface of virology, immunology and the biology of cell death. What happens when the newly synthesized viral particles leave the infected cell? Because these viral particles are coated in phosphatidylserine, professional phagocytes such as macrophages or non-professional phagocytes such as fibroblasts or epithelial cells will assume they are encountering phosphatidylserine-rich dead cell debris and ingest it in their roles as diligent garbage collectors. This ingestion of the viral particles has at least two great benefits for the virus: First and foremost, it allows the virus entry into a new host cell which it can then convert into another virus-producing factory. Entering cells usually requires specific receptors by which viruses gain access to selected cell types. This is why many viruses can only infect certain cell types because not all cells have the receptors that allow for viral entry. However, when viruses hijack the apoptotic debris phagocytosis mechanism then the phagocytic cell is “inviting” the viral particle inside, assuming that it is just dead debris. But there is perhaps an even more insidious advantage for the virus. During clearance of apoptotic cells, certain immune pathways are suppressed by the phagocytes in order to pre-emptively dampen excessive inflammation that might be caused by the debris. It is therefore possible that by pretending to be fragments of dead cells, viruses coated with phosphatidylserines may also suppress the immune response of the infected host, thus evading detection and destruction by the immune systems. 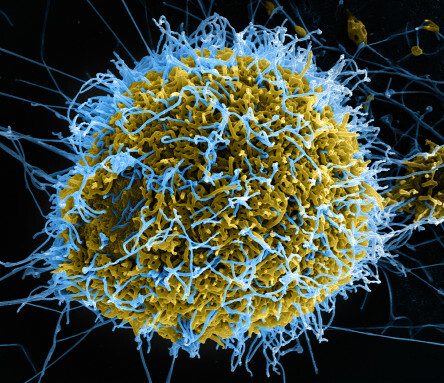 Colorized scanning electron micrograph of filamentous Ebola virus particles (blue) budding from a chronically infected cell (yellow). Credit: National Institute of Allergy and Infectious Diseases, NIH. Viruses for which this process of apoptotic mimicry has been described include the deadly Ebola virus or the Dengue virus, each using its own mechanism to create its fake mask of death. The Ebola virus buds directly from the fat-rich outer membrane of the infected host cell in the form of elongated, thread-like particles coated with the cell’s phosphatidylserines. The Dengue virus, on the other hand, is synthesized and packaged inside the cell and appears to purloin the cell’s phosphatidylserines during its synthesis long before it even reaches the cell’s outer membrane. As of now, it appears that viruses from at least nine distinct families of viruses use the apoptotic mimicry strategy but the research on apoptotic mimicry is still fairly new and it is likely that scientists will discover many more viruses which rely on this and similar evolutionary strategies to evade the infected host’s immune response and spread throughout the body. Uncovering the phenomenon of apoptotic mimicry gives new hope in the battle against viruses for which we have few targeted treatments. In order to develop feasible therapies, it is important to precisely understand the molecular mechanisms by which the hijacking occurs. One cannot block all apoptotic clearance in the body because that would have disastrous consequences due to the buildup of legitimate apoptotic debris that needs to be cleared. However, once scientists understand how viruses concentrate phosphatidylserines or other “Eat Me!” signals in their membranes, it may be possible to specifically uncloak these renegade viruses without compromising the much needed clearance of conventional cell debris. Elliott, M. R. and Ravichandran, K.S. “Clearance of apoptotic cells: implications in health and disease” The Journal of Cell Biology 189.7 (2010): 1059-1070. Amara, A and Mercer, J. “Viral apoptotic mimicry.” Nature Reviews Microbiology (2015). Note: An earlier version of this article first appeared on the 3Quarksdaily Blog. Macrophages are important immune cells which regulate inflammation, host defense and also act as a ‘clean-up crew’. They recognize, kill and engulf bacteria as well as cellular debris, which is generated during an acute infection or inflammation. As such, they are present in nearly all tissues of the body, engaging in 24/7 surveillance. Some macrophages in a tissue are derived from circulating blood monocytes which migrate into the tissue and become “phagocytic” – acquire to ability to “eat”. Other macrophage types permanently reside within a tissue such as peritoneal macrophages in the abdomen or microglia in the brain. 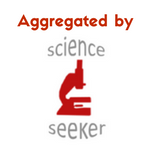 Macrophages constitute a highly diverse population of cells. For example, their tissue localization determines what genes are turned on in any given macrophage type and how they will function. One of the most important recent developments in macrophage biology and immunology has been the realization that tissue macrophages can be broadly divided into at least two very distinct subsets: M1 and M2. Pro-inflammatory M1 macrophages are predominantly involved in digesting bacteria and debris. They release pro-inflammatory molecules which then attract other immune cells and inform them that their assistance in fighting off the infection is sorely needed. M2 macrophages, on the other hand, help resolve inflammation by secreting anti-inflammatory molecules and calming down their M1 cousins. During inflammation, both sets of macrophages are activated but M1 cells appear first and M2 later. This makes sense because it allows the body to first focus on fighting off the injury with its powerful M1 cells, but also prevents excessive damage by subsequently initiating an endogenous brake (M2 cells) to prevent excessive inflammation. Inadequate activation of M2 cells during infection or inflammation can have disastrous effects. If the pro-inflammatory M1 cells have no anti-inflammatory counterpart, then they will keep on releasing pro-inflammatory molecules. These, in turn, will attract increasing numbers of immune cells and set in motion a vicious cycle of severe inflammation and massive fluid accumulation. If the levels of M1 activity are extremely high, some tissues such as the lung can be flooded with fluid and cells which prevent oxygen supply to the body, and ultimately result in death. Lower levels of persistent M1 cell activity may not lead to death, but could cause a simmering chronic inflammation and autoimmune diseases. Restoring the balance of M1 and M2 cells, or selectively increasing M2 cells is becoming a hot area in immunology. If it were possible to increase M2 cells by turning on specific molecules or pathways, one could treat autoimmune diseases or prevent exaggerated inflammatory responses. This would be a far more elegant than relying on more conventional immune suppressants such as steroids which could compromise the body’s ability to resist future infections. A recent paper published in the journal Cell (2014) by Yasutaka Okabe and Ruslan Medzhitov, has identified a transcription factor which is specific for anti-inflammatory macrophages. The researchers used a gene array to screen for over 40,000 genes and found that the transcription factor GATA6 was a key regulator of whether peritoneal (abdominal) macrophages were pro-inflammatory or anti-inflammatory. More importantly, the researchers found that retinoic acid, an active metabolite of Vitamin A, increases the GATA6 levels in macrophages, and thus pushes them towards an anti-inflammatory identity. Genetic deletion of GATA6 or depletion of Vitamin A in the diet of mice resulted in peritoneal macrophages becoming more pro-inflammatory (M1-like). Although the present study provides an evidence of the role of Vitamin A and its metabolite retinoic acid in the suppression of inflammation by activation of GATA6 in macrophages, some unanswered questions need to be addressed in future studies. The researchers showed that Vitamin A depletion pushes macrophages towards the pro-inflammatory M1-like identity, but the researchers did not try the converse: They did not test whether giving vitamin A to animals would increase anti-inflammatory macrophages. The researchers also did not track the individual macrophages to truly prove that the pro-inflammatory cells were actually converting into anti-inflammatory macrophages versus merely recruiting a pool of anti-inflammatory cells from the blood. An important lesson that we can take away from this paper is that vitamins and their metabolites are regulators of the immune response. Either too little or too much Vitamin A may be detrimental because its metabolite retinoic acid could upset the finely regulated balance of the immune system. This study is one of the first to unravel the molecular switches which regulate the formation of pro-inflammatory and anti-inflammatory macrophages. We are only at the beginning of this exciting area of research and hopefully, in the years to come, selective manipulation of these switches will allow us to treat acute inflammatory and chronic autoimmune diseases for which few therapies are available.